hound dirge riding the evening sky. of autumn, the chill in the air, the loss of the moon. did not. How sirens ripped through the night then! and ambulance onward, and how we still hear it. her aching rendition of "You Light Up My Life,"
transcribed by her teacher to bass clef for bassoon. filled the night. It could only have been the bassoon. Copyright 2010 by Pat Hale. Pat Hale has written poetry since she was a little girl and believes it has supernatural powers, not unlike those that make it possible for Superman to fly and Lassie to hear Timmy, no matter how deeply he falls into the well. 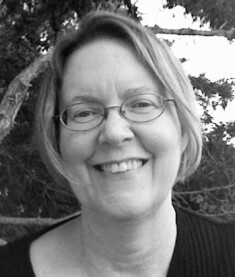 Pat's award-winning work has appeared in many journals and she facilitates a writing group modeled on the Amherst Writers and Artists method. A recent corporate layoff has provided her with the opportunity to spend more time writing and watching the Canada geese that frequent the field across from her house in West Hartford, Connecticut. Great poem. Reminds me a little of Billy Collins's poem about Beethoven writing a part for barking dog. This is absolutely delightful! "the baying of dogs sang counterpoint to despair"--a great line!